Three working days after the photo shoot simply visit the Little Dolphin Images site again and log onto the ‘customer login' page entering your email address and personal password which you created earlier. Only you and the other 4 mums from that session can see the images from your session. At this stage you will be looking at near perfect images, except they might have the odd baby handler arm, leg or hip in the shot. Well it's up to you, you don't have to buy any at all after you have paid your booking fee, but you can order from 1 image up to however many images you want. Most people at first go for the simple ‘baby or child on own shot', so we try to capture this shot first. Then when this is done, we offer other types of shots. 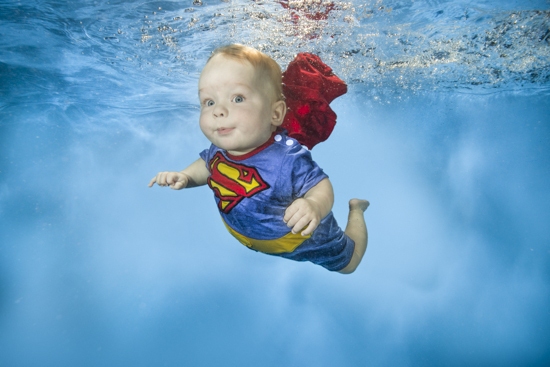 Simple and the classic shot of your baby or child swimming free in the water. These can look like the babies are emerging from soft corals out of the sea. We bring to lend you for your session a wide range of superhero costumes including Superman, Batman, Spiderman, plus fairy princess costumes complete with wings, tiaras and magic wands. We provide all the costumes and silks you could hope for. We can re-create the famous Nirvana Nevermind album cover for you, achieved through digital trickery. If you have loads of good shots but some of them have eyes closed and if you have another shot in the same session with your own babies eyes open and facing the same way, we can rectify that by professionally retouching the eyes over the shot with eyes closed. This is also included in the free retouching image price. * You do have to ask for this service in the image notes box when you check out. * Please note this technique might not work on all shots and does require an eyes open shot with the head facing the same way to start with. 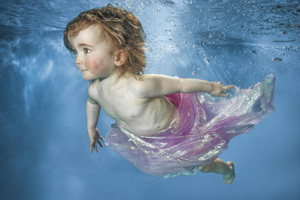 We also invite mum or dad underwater with baby if you feel you would like to at the end of your shoot. 'If you don't want to thats fine, we understand'. We are looking for that one special shot, but normally there will be many more to choose from. When you have made your image selections Zac removes the baby handler's arms, legs, hips and any harsh shadows. He will also generally give each image the Zac magic. All you will see is your baby or child surrounded by beautiful clear blue water. All this is included in the price. Please see examples above and throughout. * Important - If you want me to do any special retouching (outside the above brief) please add your retouching requests to the image notes box connected to the image you are looking at. Otherwise I have to assume no retouching is required. *Also - some extra complicated retouching is additional in cost terms to the included retouching with each image. I will inform you if this is the case before I undertake this 'above and beyond what is included' retouching. We generally avoid retouching anything which will fundamentally change the appearance of personal features on the faces of babies mums or dads. For example crucial areas of the face such as the mouth and hair lines if changed by bubbles or other things can make a person look different and is undesirable for all. Images are never used or reproduced on the Little Dolphin Images website or passed on to a third party. However once a year I look at the best images from that year and contact a handful of parents to ask for their permission to use the best images on my Little Dolphin Images gallery page. I take image rights very seriously and believe the image is the sole property of the parent and child from the family from where it was taken.